Prime Minister Narendra Modi on Wednesday teared into critics of his economic policies, saying it is not the first time that India's GDP had fallen to 5.7 per cent. PM Modi said that India's growth rate was below 5.7 per cent at least 8 times in 6 years under UPA government. PM Modi also said that only his government had the guts to undertake demonetisation. He was addressing the Golden Jubilee Year celebrations of Institute of Company Secretaries of India at Vigyan Bhavan in New Delhi. "After 3 months of Goods and Service Tax (GST), we have taken feedback in details. We have directed the GST Council to resolve the bottlenecks in GST implementation. All the concerns of businesses will be addressed by this government," PM Modi said on difficulties being faced by traders and businesses after GST implementation. PM further added that 19 lakh new taxpayers came into the tax net after GST implementation and at least 1 lakh youth have been received training in the nuances of the indirect tax regime. "After demonetisation, out of 3 lakh companies 2 lakh comapnies have been de-registered. 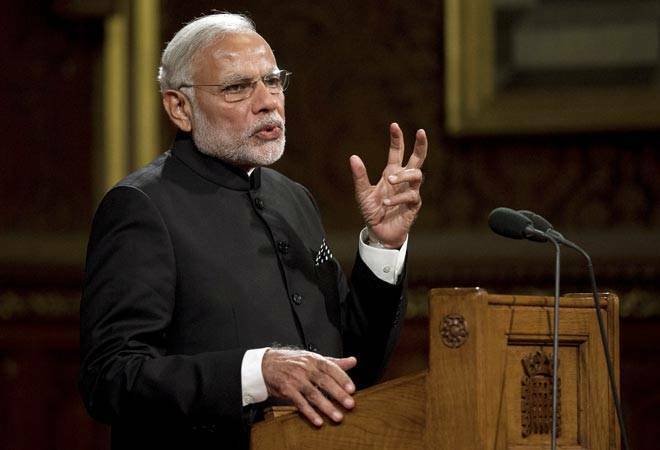 The crackdown on shell comapnies will bring more transparency," Modi said in his address. He further added, "After achieving average growth of 7.5% over 3 years, we accept that growth rates came down April-June but govt is committed to reverse it. We have brought fiscal deficit from 5.9% in 2011-2012 to 3.5 per cent. The current account deficit (CAD) has fallen to 1 % from 4 % earlier." Talking about other welfare schemes, Modi said, "More than 30 crore accounts have been opened under Jan Dhan Yojana. More than 3 crore women have been given gas cylinders under Ujjwala Yojana. Moreover, we have recently launched Saubhagya scheme for delivering electricity to poor households." PM Narendra Modi lashed out at critics of his economic policies, Prime Minister Narendra Modi today said the Indian economy was on firm footing and that he will never jeopardise the country's future for immediate gains. Modi said he has asked the GST Council to identify bottlenecks and technological hurdles faced by businesses especially small and medium enterprises. "I will not jeopardise the future of the country for my present gains," Modi said, adding the government would focus on structural reforms rather than giving doles to win praises. PM Modi said his critics were seeing slowdown in the last two quarters but were ignoring the fact that the BJP government had brought down inflation from 10 per cent in the UPA regime to 2.5 per cent, shrunk Current Account Deficit to near 1 per cent from 4 per cent and brought down fiscal deficit to 3.5 per cent from 4.5 per cent. 87 reforms in 21 sector in last 3 years. Companies have raised Rs 25,000 crore in first six months alone. 1,20,000 Km roads constructed during the last 3 years of our goverment. Cash to GDP ratio came down from 12 % to 9 %. Forex reserves have hit $400 billion under this government. Have taken adequate steps to maintain financial stability. Auto sales growing after tax implementation. Tractor sales grew 34 per cent last month. Air traffic is growing since June. FMCG growth has been strong since July. Our govt has spent 10,600 crore on renewable energy in last 3 years. Price of LED bulb under previous government was Rs 350, now it has come down to Rs 40. There was a time when India was under 'Fragile 5'. Why was India under 'Fragile 5' when so many economists were around? Some people like to spread pessimism. We are aware growth is lower, we are taking steps to improve it.